Since I’m in control of this arm of the project, I have decided to release the audio version of the book in a bit of a non-traditional way. My hope in doing this is to make purchasing and listening to it a truly enjoyable experience across the board. First, it means that anyone in the world with access to PayPal can buy the audiobook. If the print version hasn’t been available in your country, this is no longer an issue for you if you have a PayPal account or can use their credit card payment function. Second, there is no DRM on this file, so you can listen to it on as many media devices as you choose. However, it also means you could give it away to someone for free. I’m asking you to please not share the audiobook with anyone outside of your household. 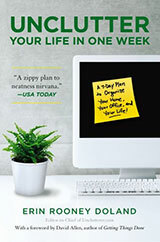 As I mentioned previously, I financed this audiobook personally. I spent thousands of dollars on voice talent (the incredible Bhama Roget), a professional recording studio (Cedar House Audio), editing, the server space to house the files, the creative designer to make the cover for the audiobook, etc. I need to sell hundreds of copies of this audiobook to even recoup my costs. I’m not complaining — as I very eagerly took on this expense — I’m just requesting that you please respect what we have created and pay for the audiobook if you plan to listen to it. Finally, I was able to ensure the audiobook includes the full text. It is unabridged and just shy of being six full hours in length. This means it’s a little weird in a couple places where the charts are read word-for-word, but I know we have numerous Unclutterer community members who have visual impairments and I didn’t want them to miss out any parts of the book. And, if you are sighted, the PDF worksheets contain a visual representation of those charts for you to reference. 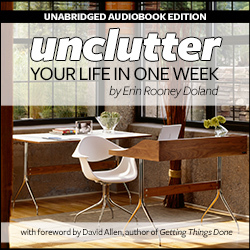 Again, I am truly delighted to be able to offer the audio version of Unclutter Your Life in One Week for sale. If you purchase it — and thank YOU so much if you do! — I hope you enjoy the book and Ms. Roget’s reading of it. I think the finished product is truly top notch. iTunes: This might be a good option for you if you are a regular iTunes user. 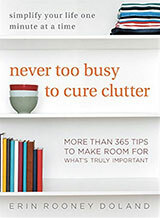 Amazon: This might be a good option for you if you regularly use Amazon for purchasing audiobooks. Audible: This might be a good option for you if you have subscription credits already with this service.